Katrina Trinko, managing editor of The Daily Signal since the 2014 debut of The Heritage Foundation’s multimedia news organization, has been named editor-in-chief. Rob Bluey, formerly editor-in-chief, announced Trinko’s promotion Wednesday to Heritage’s communications team. Bluey assumes the title of executive editor of The Daily Signal while remaining The Heritage Foundation’s vice president for communications. Trinko retains the title of director. It’s because of her leadership and commitment to outstanding journalism that The Daily Signal is a must-read source of news and commentary. I congratulate her on this promotion and look forward to working with her to continue growing our reach and influence. 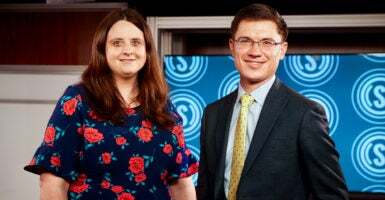 Trinko, 31, will continue to co-host The Daily Signal Podcast, which delivers news, analysis, and interviews from a conservative perspective five days a week. She may have a little more trouble making time to write hard-hitting commentary, as she has for nearly five years on everything from religious freedom and the media pack to gender identity and the “Me Too” movement. She remains a member of USA Today’s Board of Contributors, writing columns on topics ranging from education and culture to immigration and technology. “I’m honored to become the editor-in-chief of an outlet focused on illustrating how Washington’s policy decisions affect the lives of everyday Americans, as well as producing robust, data-driven op-eds that highlight the conservative perspective,” Trinko said. The Daily Signal’s growth in influence is reflected in 26.8 million site visits in 2018 and 400,000 subscribers to the “Morning Bell” email that arrives in inboxes weekdays. In addition to news stories, podcasts, and video reports on key issues, The Daily Signal is known for timely commentary and analysis, much of it provided by more than 100 policy experts at The Heritage Foundation. The Daily Signal launched in June 2014, although Trinko was hired as managing editor six months earlier. The former National Review reporter joined Bluey and Heritage’s communications team in envisioning and setting up a digital news and opinion site zeroing in on public policy and policy debates that affect the lives of Americans. As director and managing editor, Bluey said, she has led the day-to-day operations of The Daily Signal by setting the primary news and commentary focus; assigning news stories and commentary pieces; managing editors, reporters, and contributors; and pushing the team to stay competitive in a crowded, evolving media landscape. As The Daily Signal approaches its fifth anniversary in June, he said, Trinko will continue to be responsible for ensuring that it adheres to high editorial standards, covers and explains Heritage’s key policy goals, and innovates to achieve future growth. Before joining Heritage and The Daily Signal in January 2014, Trinko was a reporter for National Review and National Review Online for four years. She covered Congress, political campaigns, and state governments. A California native, Trinko holds a bachelor’s degree in liberal arts and philosophy from Thomas Aquinas College in Santa Paula, California. She interned in the newsroom of The Bulletin in Philadelphia and later at National Review before becoming a staff member there. 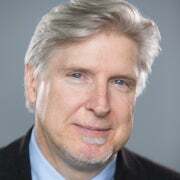 Ken McIntyre, a 30-year veteran of national and local newspapers, serves as senior editor at The Daily Signal and The Heritage Foundation's Marilyn and Fred Guardabassi Fellow in Media and Public Policy Studies. Send an email to Ken.